I am often asked (or overhear others asking) what it is exactly that a parent should buy for their homeschool curriculum if they plan to use A Beka. It can be SO overwhelming to look at the site and see all these books, not knowing which you really need, or which ones you can get by without, or even what they are specifically FOR. Additionally, figuring out which other products would be helpful is yet another challenge. Since I've answered this question for multiple friends and acquaintances, I figured perhaps a post on the subject would be helpful to many more. 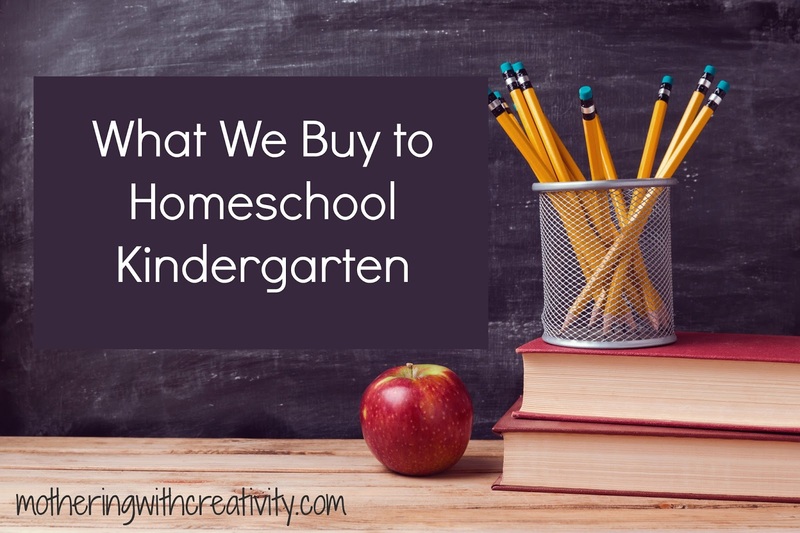 I'll first list my A Beka curriculum suggestions, and then I'll list all our other favorite homeschool products for this age. There are SO many curriculums out there. If you're unsure of which curriculum to use, my suggestion would be to ask other homeschoolers. There is no "one size fits all" curriculum, and even within our family, we've found that some of our children do better with one method or curriculum over another. For this post, I will be specifically detailing what our family buys for the Kindergarten school year, with A Beka as the primary curriculum. A Beka is a Christian based curriculum, and has been around for a long time with a great academic track record. It is used by both Christian private schools and homeschoolers. Although with older grades we've branched out to some other curriculums based on our daughter's needs, we continue to use A Beka for Kindergarten because I feel that it is such a great program. (This is not a sponsored post, just my honest feedback for what we find useful and/or necessary for Kindergarten when using A Beka curriculum products. Some of the below Amazon links, however, are my affiliate links). *When you visit the A Beka site, you will select the Kindergarten: 5 year old (4 year old Kindergarten is just their preschool program). *A Beka offers both cursive and manuscript even at the Kindergarten age. You can start with either (cursive is actually easier for children to write). In our home, we start with manuscript in Kindergarten, and then introduce cursive in 1st grade. Our reasoning being that most things they read are in manuscript, so learning to write manuscript first just makes more sense. We've found that cursive in 1st grade comes very naturally since they already know all their letters and how to write in manuscript. *Curriculum book: Necessary. This was recently redone and is now so much easier as all subjects are in the same curriculum book. If you look for used curriculums, you will likely find a great deal, but be sure to find each of the curriculum books (one for language, one for math, etc.). *Basic Phonics Flashcards: Helpful. These are not totally necessary, but are definitely helpful to aid in teaching your child phonics. The curriculum books do call for them quite regularly. *Phonics Charts and Games: Necessary. I have always found all the charts for all grade levels to be quite necessary and well used. I'd definitely recommend buying and laminating these. *Numbers Charts and Games: Necessary. Same as above, we always get a ton of use out of our charts. *Manuscript Curriculum. Not Necessary. There is a Manuscript Curriculum book available, but I just don't find this necessary for teaching handwriting. I will just follow the lead of the student book, and spend time demonstrating letters on the board, tracing in the air, finger tracing on sand, etc. and then let the child do their handwriting page for the day. *Homeschool Learning Games. This must be new as we've never used this and I can't recall seeing it previously. Since we don't often use all of the games included in the Numbers Charts & Games and Phonics Charts & Games, I'm guessing our family would not use these a great deal either. *K5 Child Kit (manuscript or cursive): This child kit really has all the essentials in it, and you'll save a little bit of money by ordering it as a kit. We use all of these in their entirety. 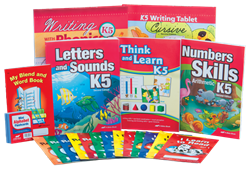 This kit includes your child's handwriting books, math books, and language books, as well as all the basic phonics readers. *Classroom coins kit. These are large coins that we laminate to last a long time. We still use them with our 3rd/4th grader. They are optional, but we use them a lot and find it's easier to have these than keep real coins readily available for school all the time. *Science: I don't use A Beka's science curriculum until 3rd grade. Up until that point, we just use books from the library and explore outdoors and utilize Pinterest for fun experiments. As far as our core curriculum goes, the above is it. Beyond that, we have a variety of other products that we love and use regularly in our homeschool at this age. The great thing about these is that so many of these products will grow with your child over many years, being used in a variety of ways for different age groups. So once you buy these, you'll get many years of use out of it. *Various counters for math purposes- Mathlink cubes, Bug counters, and Two Color Counters are some examples. We'll also find holiday themed items to use as counters from the Dollar Store. *Bucket Balance- All of my children enjoy experimenting with the balance-from my 2 year old on up to my 4th grader. *Butterfly garden- We love utilizing these butterfly gardens for science! *Various Dice- We utilize big foam dice a lot in kinder, and also find that we use these polyhedral dice for various games, especially later in the year. *Dixon Ticonderoga Beginners Pencils- These are AMAZING. I no longer by any cheap pencils, but only buy Dixon Ticonderoga (I'm tired of wasting half a pencil while trying to get it to sharper properly). For my Kindergarteners, though, I use these "Beginners" ones, which are a bit thicker and SO much easier for them to grip and write with correctly. LOVE these! *Snap Circuits- We first discovered these at our local Discovery Museum and fell in love. We bought a deluxe set last year, and while all of my children enjoy creating different circuits, it's actually my Kindergartener that loves it the most! *Microscope- All of our kiddos love exploring with our microscopes. We actually have two sets so multiple kids can explore and study together. As they got older, we also ordered additional sets of pre-made slides for them to use. Do YOU need all of these? Not really. You'll probably see and find lots of great products and resources that you love as you get going. If you are going to start with A Beka, however, most of the A Beka products I listed above are really quite necessary to get going. Please remember that eBay and Facebook swap boards are great places to find used curriculum books, but you'll probably want to buy all your workbooks new from the main A Beka site. Questions still? Ask away in the comments! Best of luck to you in your homeschooling journey!